Whether you're PRObama, NObama, or still undecided, 52 Reasons to Vote for Obama gives you all the information you need to share with friends, debate with relatives and decide for yourself as we head toward one of the most important elections of our lifetime. I'll post a new reason in random order every Monday through Friday from now 'til the election. Elections matter. We may like them, we may hate them. We may be sick and tired of campaigns, or we may look forward to the next one with the anticipation of a child. However you may feel, elections are important, and the choice we make will have dramatic impacts on the lives of hundreds of millions of people, sometimes immediately, sometimes not for a generation. Some of these effects are minute, hardly perceptible, while others are dramatic and far-reaching. Americans took to the polls and elected Franklin Delano Roosevelt in 1932, and he pulled us out of the Great Depression. The election of 1960 brought us Kennedy and, later, Johnson, and with that the promise of equality for black America. When Bill Clinton was elected in 1992 he helped usher in a wave of economic growth and prosperity unseen in modern times. When we Americans go to the polls this November we will face as stark a choice as we have seen in generations: whether to go forward or roll dangerously backward; whether all Americans are truly created equal or whether the rights and privileges commonly associated with our great country will be reserved for a select and privileged few; whether we will continue to expand the American dream or whether we will see it contract into itself. In a clear, concise, and easily digestible way I attempt in 52 Reasons to Vote for Obama to outline why I believe Barack Obama should be returned to office. To be sure, a few of the reasons are tongue in cheek, meant to offer a bit of needed levity in an otherwise serious discussion of national priorities and fundamental principles. But the majority of reasons outlined herein represent what I see as an overwhelming rationale to cast a vote for the president, not only based on the extraordinary accomplishments he has achieved against considerable odds, but also taking into consideration what he is likely to build for this nation and the global community over the next four years. The order of the reasons is not meant as an absolute ranking of importance, but rather should be considered in several groups, much like a play unfolds in three or four acts. The first half contains what I consider to be President Obama's greatest achievements, with the first ten being particularly noteworthy. Some of these, like the killing of Osama bin Laden and health care reform, are well-known; others, like cutting credit card fees and keeping nearly 75 percent of his campaign promises, are probably not. The second set begins exactly halfway through, with Mitt Romney as reason number 27. His position on the list is purposeful, for I believe Barack Obama should be considered first on his own merits, before his challenger is assessed. The reasons immediately following Mitt Romney cast this choice in sharper relief. As with any long production, the audience deserves an intermission, and for that I provide a series of reasons meant to show a lighter side of Obama, as well as interject some humor and reveal a few of my own biases. After throwing in a few teasers for my Republican friends toward the end, I conclude with two broader themes, theses that speak first to what I see as fundamental character differences between the two candidates and finally to the larger importance of this election, one which will have profound implications not only for the citizens of our country, but for all of humanity. 52 Reasons to Vote for Obama paints a portrait of a president with an unrivaled command of the interconnectedness of issues, a true understanding of "the big picture," and an ability to rise above the fray to deliver powerful results for the American people. Barack Obama has displayed the strength of bold leadership akin to our greatest presidents, and with that has forever transformed the office. His daring, principled commitment has brought far-reaching change to America and the world, and I believe we are all better for it. I hope you enjoy the book, no matter your political persuasion. For the Obama supporters out there, I hope I have provided some new information and energized you to spread the word to the masses. For those still on the fence, I hope I have given you cause to come over to our side. And for those of you committed to Romney, may this serve as a warning that you've got one tough battle ahead. And for everyone, regardless of party or ideology, please make sure to vote, and encourage others to do the same. It is not only a civic duty but a solemn responsibility that we must pass from one generation to the next. For those unable to vote in the United States, please share this message with those who can! This election is likely to be very close, and as we've seen before, every vote counts. Finally, I encourage you to join in the conversation and share your own reasons by visiting 52 Reasons to Vote for Obama on Facebook... I'd love to hear from you! 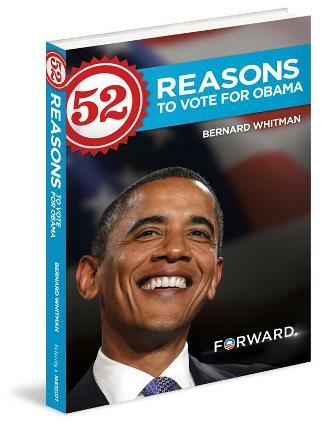 To purchase a copy of 52 Reasons to Vote for Obama, visit Amazon.